This blog is dedicated to recording God's work in our Bright Lights group in Singapore. 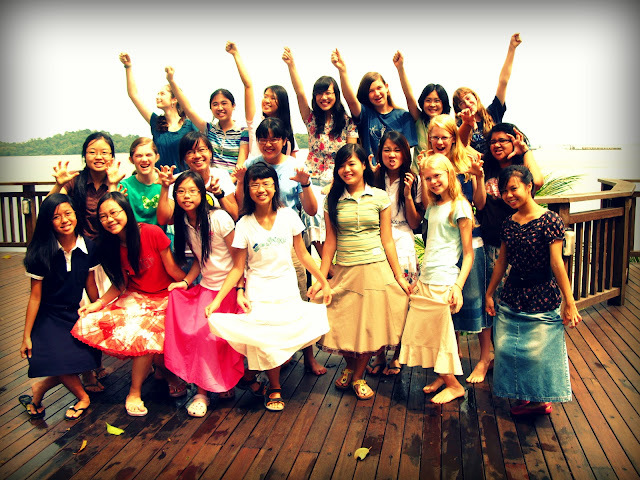 Bright Lights is a girls' discipleship group started in the US by Sarah Mally in May 1996. The ministry has since grown greatly with over 500 groups (as of May 2012) both in the US and internationally. The goal of Bright Lights is to train young ladies to...Be Radiant In Godliness, Holiness and Testimony. During the meetings, girls are encouraged to seek the Lord with all of their heart and be strong for the Lord in their youth. Bright Lights provides girls with the friendship, fellowship and Godly influences of young leaders who are themselves bright lights for the Lord. In September 2006, Sarah Mally and her team held their first international Bright Lights conference...here in South-east Asia! The first Bright Lights group in Singapore began in November 2006. Since then, we've been enjoying our fortnightly meetings. They include singing, teachings and discussions on practical subjects, activities and crafts. Oh...and how could we forget to mention, lots of laughter, fun and good fellowship:) We have been greatly blessed by this ministry, and thank God for His hand in bringing this all together. Anyhow, here's extending to you our warmest welcome and we hope that what you read here will draw you closer to our Lord Jesus Christ. See you around!